To execute temperature and humidity measurement, calibration and analysis tasks as precisely and error-free as possible, it is important to monitor the temperature and air humidity of clean rooms, laboratories and calibration rooms in real time. Constant values are needed as even in case of a minimal variation high-precise tasks cannot be guaranteed any more. First of all the reference values for temperature, air humidity and quality of the ambient air are defined. 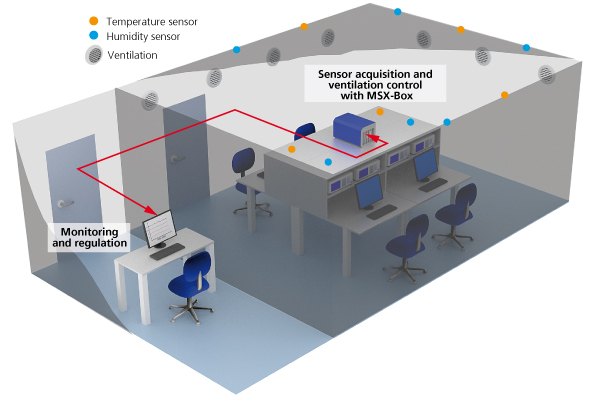 The temperature and the air humidity measurement are made through sensors. As soon as there is a change in the room conditions and the tolerance values are exceeded, the ventilation is activated to restore the reference values. For the acquisition of the sensor values the real-time measurement and control system MSX-Box is equipped with the temperature and humidity measurement board APCI-3200 and the analog input board APCI-3001. The digital output board APCI-2032 is used for the control of the ventilation. The Ethernet port allows a connection to databases, the integration in a network for PC access (system is protected by password), connection to external networks (internet, mobile phone).